I'm so excited to welcome our guest, Brittany, today. She is a long-time friend and an Orlando local. Brittany was gracious enough to share some great tips with us - and had so much to share that we've broken this into two posts! Don't miss Part 2 on Tuesday! 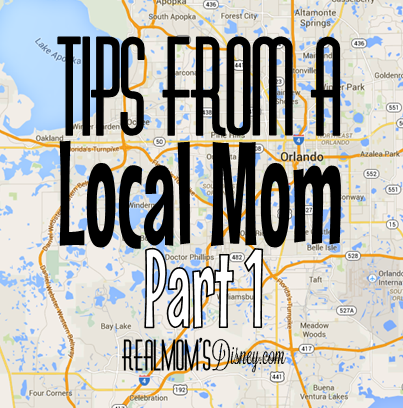 RMD: What is your favorite thing about living near Disney World? Brittany: Hands down, my favorite thing about living near Disney World is having annual passes. I love that we don’t have to go from open to close and try to squeeze in every nuance of the park to get our money’s worth. It is such a blessing to be able to hop over for a few hours, have some fun, and then leave when the kids start to reach that cranky/tired stage. A great bonus is that my hubby and I get to steal away for Disney dates every once and a while. It’s fun to be kids ourselves once and a while! 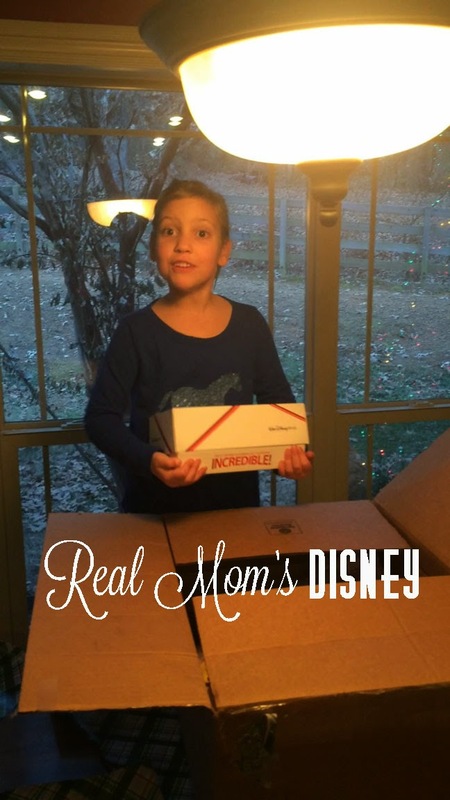 RMD: How often do you go to Disney as a family? What’s your favorite time of year, and what’s your favorite park? Brittany: We try to go over to the parks at least two to four times a month. This handy little crowd calendar helps me plan our trips. Because of the great Florida weather, we love going to the parks most in February, March, and April. The summer is bearable, but we only go mornings or evenings to avoid the suffocating heat. If you can get to Disney during the holidays (especially during Christmas season), the decorations are fantastic and you must schedule some time to tour both the parks and the Disney resorts by monorail. My favorite park is definitely Magic Kingdom, but it is also the busiest, so Animal Kingdom is at the top of the list, too! 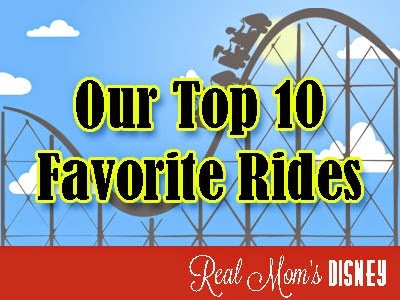 RMD: Do you have a favorite Disney place to eat? Brittany: If it is just my husband and me, my favorite place to go is Teppan Edo in Epcot. I am a sucker for delicious hibachi restaurants (the white sauce!). If it’s the family, here are my three favorite options: cheap: Columbia Harbour House (great chicken fingers, plus grapes and yogurt with the kids meals), mid-range: Be Our Guest Restaurant for the quick-service lunch (tip: Eat lunch around 10:30am and you will be able to get in without a wait and The Master’s Cupcake is the “grey stuff” from the Be Our Guest song in the movie), expensive: It’s a toss up between the Crystal Palace and Cinderella’s Castle. The food is great at both; it just depends on the experience you would like. 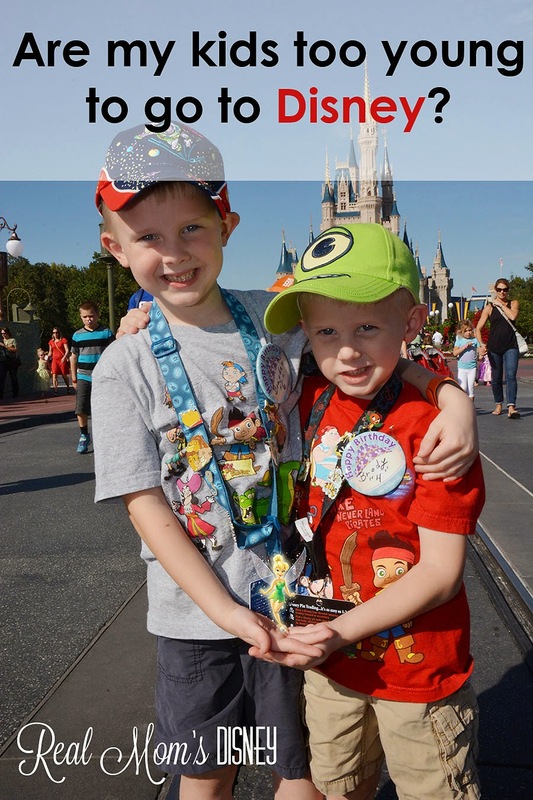 RMD: What do you wish every family visiting Disney knew? Brittany: Don’t come to the park with a list of 30 things you have to do before you leave. Even if you live far away, have realistic expectations for your family. Plan to relax and just enjoy being there. It breaks my heart to see families who have saved for years to be able to come try to fit everything in and they are just miserable. It’s a magical place - make happy memories. RMD: What’s your favorite non-Disney place/activity to recommend to visiting friends? 4Rivers Barbeque is delicious. It’s about a 30 minute drive from the Disney area, but SO worth it. Wonder Works is a lot of fun for the whole family. SAK Comedy Club is a great date night if you can sneak away (make sure you go on a family night for appropriate content). There is a brand new American Girl Store at the Florida Mall – you can take your daughters and have lunch in the café (make reservations!). It is still Disney related, but we LOVE playing mini-golf at Fantasia Gardens. My husband and I have pretty intense competitions on the more realistic course, but they have a fun one for the kids, also. Near the same area is another fun mini-golf course called Winter Summerland. If you have kids who love go-carts, Fun Spot is a great place to stop. Don't miss Part 2, where Brittany will share her must-do list for each park and favorite secrets/tips! We've traveled to Disney World in parties of all sizes, ranging from just us as a couple to our most recent trip, which was a group of 14 people! This trip was with my husband's side of the family. There were 8 adults and 6 children (ages 6 and under!). As the coordinator for our trip, I needed to figure out the best way for us to get "family time" while also allowing everyone to do their own thing and go their own pace. Our solution? Family meals! We planned one meal per day that we would share together. The rest of the time was spent touring as individual families, which worked GREAT! There was one day that we shared lunch AND dinner, but every other day we met up for one meal together. We loved catching up over a meal about what we had been up to that day! This was an easy choice: buffet, laid-back atmosphere, and CHARACTERS! The food was really good (with lots of different options) and we got to interact with characters as an entire family of 14 - which would be difficult in the parks! To be honest, I only chose this for our group because we wanted the Fantasmic Dinner Package (which includes dinner and reserved seating for a showing of Fantasmic). Normally we wouldn't choose such a nice restaurant for a large group with young children (it's just a nicer atmosphere and a more sophisticated menu), but this ended up being a great meal! The prix fixe menu was a good value and the kids enjoyed their included ice cream dessert! It was definitely worth the reserved seating at Fantasmic, which is always crowded! We ate here for lunch and it was delightful! The pizzas are huge and feed LOTS of people, so we just ordered 2 pizzas and went to town! We were also seated in an area that had lots of windows and felt very private, so that was nice to have our own "space." This is probably my favorite restaurant at Disney World right now! This was our own family's second time to eat here, but it was the first time for our other family members. Food is served family style, which is really easy and convenient - no ordering necessary! They just start bringing the food, which is wonderful for antsy kids (and adults!). So delicious and fun for families - especially when the kids can join a little parade around the restaurant! Another buffet with CHARACTERS! I prefer Chef Mickey's as far as the food goes, but Crystal Palace still offers variety and kid-friendly items. Crystal Palace is the most "hectic"-feeling to me, but we were seated at the back of the restaurant (by the windows), which was the perfect area! We weren't near the buffet and there weren't a ton of people walking by our table (which I've experienced before). Overall, this is family-friendly and was a good fit for what we needed - lots of options and the opportunity to hang out with Winnie the Pooh and friends! Disney does a great job in providing family-friendly restaurants and experiences. Do be aware that sometimes your party will have to be split up if there's a large amount of people. We only had this happen at Chef Mickey's and Crystal Palace, but our tables were right next to each other. If you have a large family gathering at Disney World, I definitely recommend aiming for one shared meal a day. It's a great balance and allows you the family time you want while giving freedom the rest of the time! 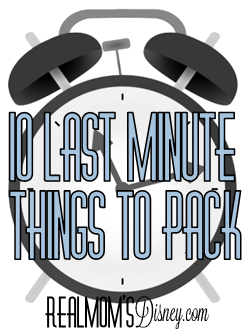 When I pack for a trip, I can make list after list, but I always feel like I’m forgetting something when we pull out of the driveway. Because I surely can’t be the only one who’s forgotten something and had that forehead slap moment, here are a few things to check before you walk out the door. Tip: Make a last-minute checklist! Download our printable list for free! We’ve already included the things listed below, as well as a few reminders to check the locks, take out the trash, etc. You can add whatever you want to make sure you remember before you walk out the door! 1. Chargers & a power strip. With lots gadgets and devices in the family, don’t forget everyone’s chargers! Although most resorts have enough outlets, they’re not always in the most convenient location. Consider taking a power strip along with you to plug in your devices in the same place. 2. Glasses/contacts. I might have left my glasses on the bedside table at home a time or two. Don’t forget to grab those and just to be safe, an extra pair of contacts. 3. Medications. Leaving your over the counter allergy medicine would be a pain, but forgetting prescription medication could really put a kink in your vacation. Double check! 4. Magic Bands! If you’re flying and utilizing Disney’s Magical Express, make sure these are in your carry-on bags. 5. Sunscreen. Even if you’re going to Disney during the winter, don’t forget your sunscreen. Vacations with sunburns are not fun! If you’re flying, be sure to put sunscreen in your checked bag (inside a Ziploc baggie in case it leaks), because the TSA doesn’t play around with those carry-on restrictions. 6. Hand sanitizer. More on that here. 7. Napkins/paper towels. If you’re driving, make sure you have a good stash of napkins in the glove compartment. Even better, take along a roll of paper towels. They come in handy during the stay too, especially if you have breakfast or snacks in your resort room. 8. Quarters and pennies. If you’re driving, you may need quarters for tolls. And if you like inexpensive souvenirs, there are penny press machines in several locations around Disney World (You’ll need 2 quarters and 1 penny for each pressed penny.). A great way to transport coins is an M&M Minis tube, and they fit nicely in a center console or glove box. 9. Snugglers! If you’re traveling with kids, and those little sweet things have special snugglers to sleep with, it is imperative that you do not forget them. I can promise that you’ll find lots of great stuffed animals and blankets at Disney, but if your family is like ours, nothing can replace that special thing your kids like to snuggle with. If you plan for them to sleep during the trip, don’t forget the snugglers! 10. Pillows. I know that not everyone travels with their pillow. Some only travel with their pillow. If you are like me, and can walk miles through the parks without complaint during the day but still need your pillow to sleep well at night, grab that pillow! There are a few things to remember. And as usual, I’m sure I’ve forgotten something. Check out other strange things I’ve packed here. What have you left behind when you went on vacation? "Are my kids too young? Will it be a waste of money to take them now?" While I personally don't think I could handle taking a newborn to Disney, (and trust me, a lot of people do take newborns to Disney!) I do think it is perfectly reasonable to take toddlers to Disney. If you think you will only take one trip to Disney, then I would suggest waiting until your kids are old enough to remember it and tall enough to go on all of the rides. However, if you plan on coming back, or are at least open to the possibility that after your first trip you might just fall in love with all things Disney and try to go back every year, then I would suggest going while your kids are small. There's something I can't begin to explain about little kids and Disney. They totally believe everything they are seeing is real, and that the movies they watch on TV have come to life. I'll never forget watching my boys meet Jake (from Jake and the Neverland Pirates) for the first time. They were completely and totally in awe. You probably won't be able to make it from rope drop (when the park opens) until closing...at least not without a significant nap. Another option if your kids are good nappers would be to show up at rope drop one day, and stay for the fireworks on another day. Take a break! Halfway through our trips we take a break and go to the beach or hang out at the resort. It helps to let everyone rest and relax so that you don't feel completely worn out at the end of the trip. Rent (or bring) a stroller. 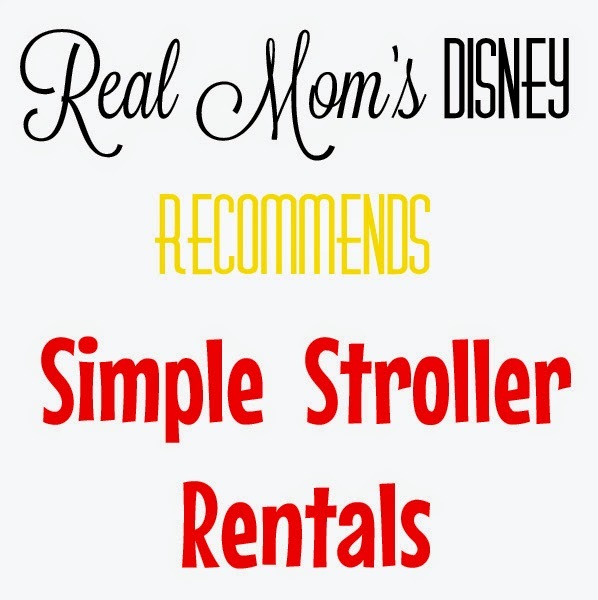 We always rent a stroller (I don't like taking a chance that the airline will tear ours up...it happened once!) which allows our kids to take breaks and even rest their eyes for a few minutes. By letting them ride instead of walk, they don't tire out so easily! Also, its great for hauling around your drinks and park purchases! Have a plan. Know what park you plan on going to every day and have an idea of what rides are important to you. You'll save yourself a lot of stress by consulting crowd calendars and have a plan before you go. Set up your Fast Passes. Little kids hate standing in long lines. By taking advantage of Disney's Fast Pass Plus system, you can avoid that. Figure out which rides have the longest lines (like Seven Dwarfs Mine Train, Expedition Everest and Kilimanjaro Safari's to name a few) and be sure to secure FP's for those. It will save you lots of screaming! 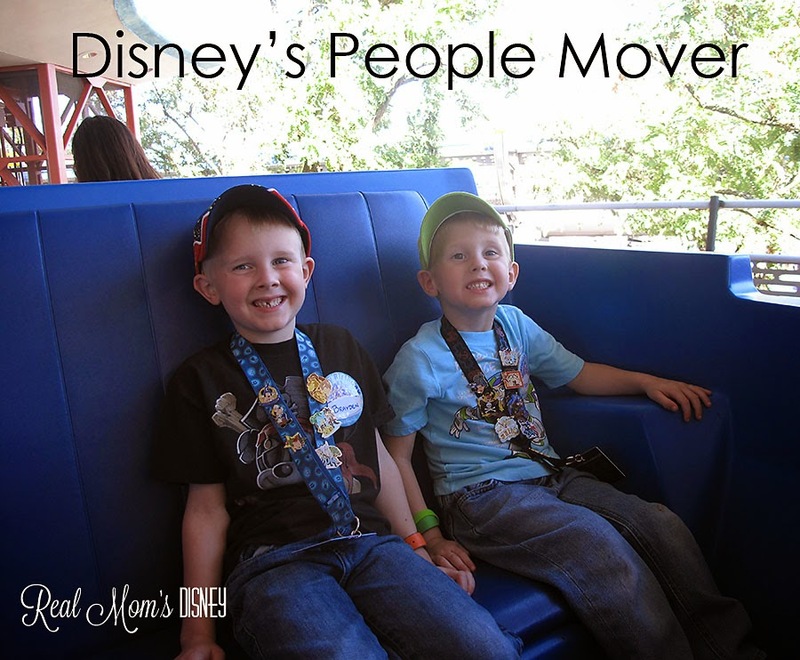 Sit, relax and take the People Mover. Make sure to take small breaks while at the parks. Stop and have a Dole Whip, sit and watch a parade and when all else fails, go ride the People Mover. These little breaks will really help recharge everyone's batteries! Let em' run! In complete contrast to my above tip, I also suggest finding a spot to let your kids run around for a bit. Sometimes, after standing in a long line, we found that letting them run for 3 or 4 minutes was exactly what they needed! I’m not a surprise person. I hate surprises. With a passion. I’m a planner. I like to prepare myself. However, my people are the opposite from me. When it came time to plan our December 2014 trip, Nick suggested we surprise Anniston. Since she loves surprises, so I knew she’d love it. We talked about when would be the best time to tell her. Originally we wanted to tell her the morning we left. However, after we booked our airline tickets, our flight was so early, we knew that wouldn’t be an option. We decided on the night before we left. Then came the hard part – trying to decide exactly how to break the news. There are so many creative people out there who have come up with so many ways to do this! We talked about having a week long Disney special. We’d watch movies and theme dinners, etc. but ultimately that just didn’t work with our schedule. We talked about telling her right as she was falling asleep as part of our nightly routine of “silly things” we say to help her with nightmares. But we decided then she might not sleep at all. We decided to wrap a special present and have her open it when we got home. Like I’ve mentioned before, I love having outfits made for her to wear while we are at Disney (check out the ever fabulous SheSheMade on Instagram). 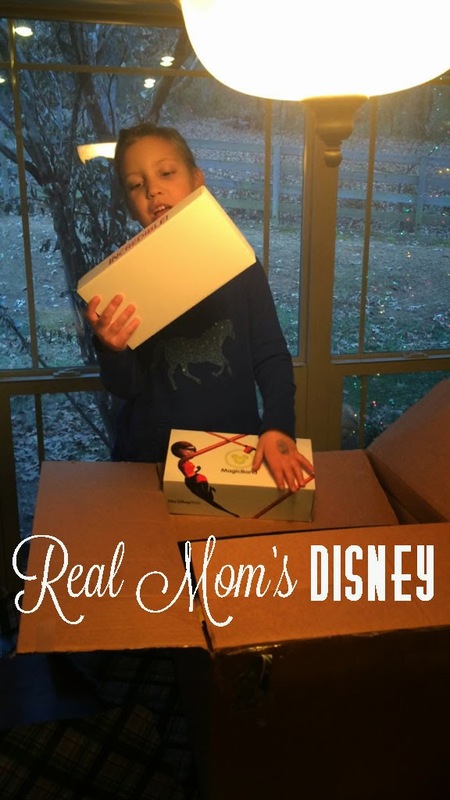 We put those, all of the stuff we got her for the plane ride, our Magic Bands, her airline tickets, and an Olaf balloon in the box and wrapped it up. 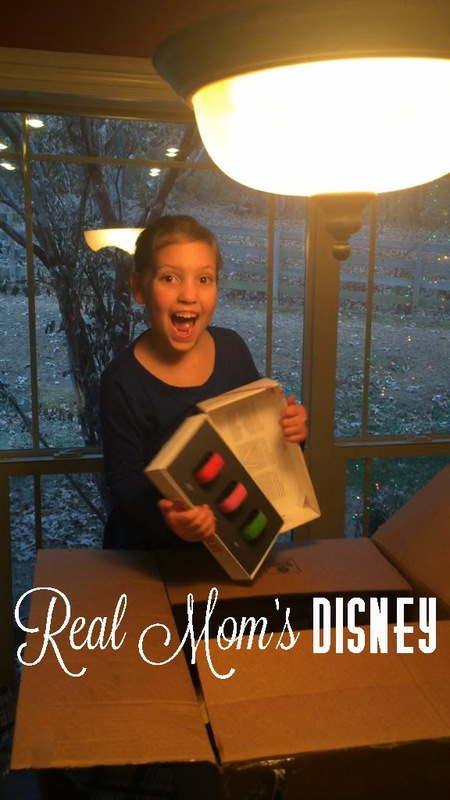 Our vision was that she’d open the box, the balloon would pop out, and she’d get excited and dig in. Anniston isn’t your typical kid when it comes to opening presents. She takes her time. She savors the moment and talks non-stop the entire process. What should have been a minute or so ordeal, well, let’s just say I stopped the recording after almost six minutes. 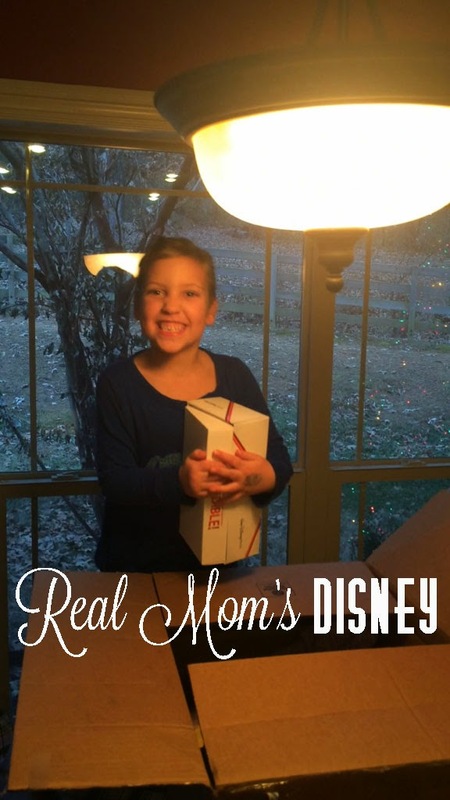 She understood what was happening when she opened the Magic Band box. She was excited, but not at the excitement level I had hoped for. She still had the rest of the box to go. Now as the night wore on, she definitely got more and more excited. To the point where I wondered if we’d even be able to get her to bed excited. If I had it to do over again, I would just wrap the Magic Bands and airline tickets. That would have been enough for her to figure it out plus I think it would have allowed her to show her excitement more. She couldn’t concentrate on the excitement of getting to go to Disney because she still was concentrated on the rest of the present. After that extremely long intro, here is the real meat of my post today. 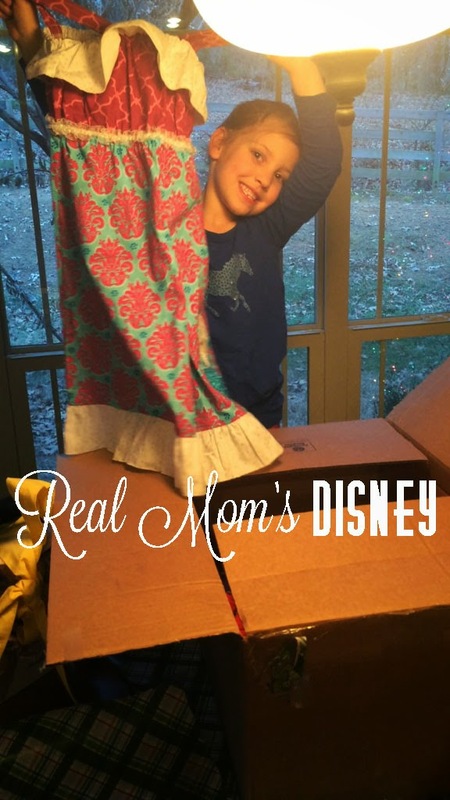 If you decide you want to surprise your kids with a trip to Disney, here are a few links to creative ideas to break the news to them. Our very own Jenna has a couple of adorable ideas. Check out this post and this post! WDW Prep School has 4 cute idea links. One being a scavenger hunt. So fun! 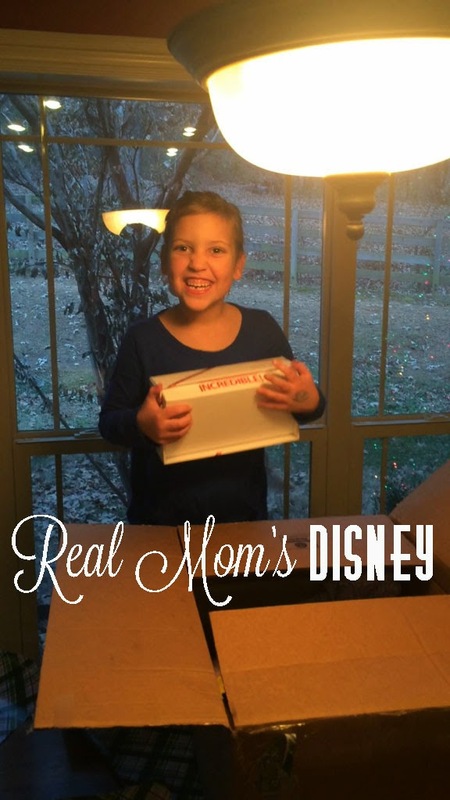 Dixie Delights created a special meal as a part of a countdown to her Disney trip. You could do this for a theme night and then break the news at the end of dinner. So fun! Check out this awesome doorscape from Prettify Your Life! How fun would it be to come home to that? Love! If you are waiting for the day of, you could talk about having a day of fun. On the day of the trip, or day of fun, your first stop could be the airport. From this point you could break the news right then or keep it going for a little while longer. Pinterest is always a great place to find cute ideas. 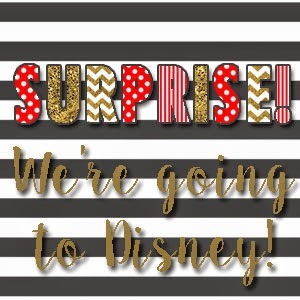 Just do a search for “surprise Disney trip ideas” and you’ll find tons of great ideas. There are so many ideas out there. These are just a few and a few links to get your brain rolling. I honestly wasn’t sure about the whole surprise trip thing. I’m glad we did it. Our next trip, Anniston will be old enough to assist in the planning so that will be another fun first for us! Do you have a great surprise story? Or a great idea? Leave them in the comments; we’d love to hear them. Happy Planning! 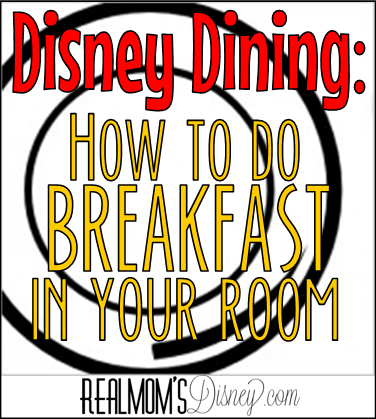 So maybe eating breakfast in your room isn’t exactly “dining”, and it’s certainly not glamorous. But it is quick, convenient, and can save you money and/or dining credits. With a little preparation, it’s actually pretty easy to accomplish. We drive to Disney, so I prefer to take most things with me, then grab a few items once we get into town. Believe it or not, it doesn’t take up that much room in the car. If you fly or just don’t have room in your vehicle, you can order groceries online and have them delivered to your resort! Talk about convenience. Garden Grocer has a huge selection of items, including paper goods, baby needs, organic and all-natural products, and produce. First, decide how many breakfasts/snacks you’re going to eat in your room. (Our Dining Credit Planner may help.) On our last trip, we did a character breakfast one morning, but either grabbed something in our resort food court or ate in our room (or a combination of both) the rest of the time. You can certainly utilize a snack credit on the Disney Dining Plan for some yummy breakfast items like a cinnamon roll from Gaston’s Tavern, pastries at the Main Street Bakery in Magic Kingdom, or a cupcake from Starring Rolls in Hollywood Studios. The Quick Service food court at our resort had some yummy offerings as well. Next, think about what you like to eat for breakfast. You’re certainly not going to be able to cook a three-course meal in your room, but you can have a hearty and healthy breakfast. With a mini fridge in most rooms, yogurt and fruit are quick and easy, and you can easily keep milk for cereal. Instant oatmeal is also quick and hearty. You can use hot water from the tap or use your Rapid Fill Resort Refillable Mug to bring some hot water back from the food court. As a special treat for our kids on our last trip, we had Pop Tarts along with our regular cereal bars and granola bars. After you’ve thought about what you want to eat, you’ll need to consider what you need to eat with. Spoons, plates and/or bowls, and napkins/paper towels were on my list. These can be packed with your other items or ordered from a place like Garden Grocer along with the rest of your grocery needs. You can have a great breakfast in your room – it just takes a little planning. So fuel up before you head to the parks and you’ll be ready for that rope drop sprint!